The planned merger of retail giants Ahold and Delhaize, first announced in June 2015, seems all but certain as the companies announced a divesture of a combined 86 US stores earlier this month en route to gaining Federal Trade Commission approval. Subject to such approval, the companies seek to close the deal by the end of July. 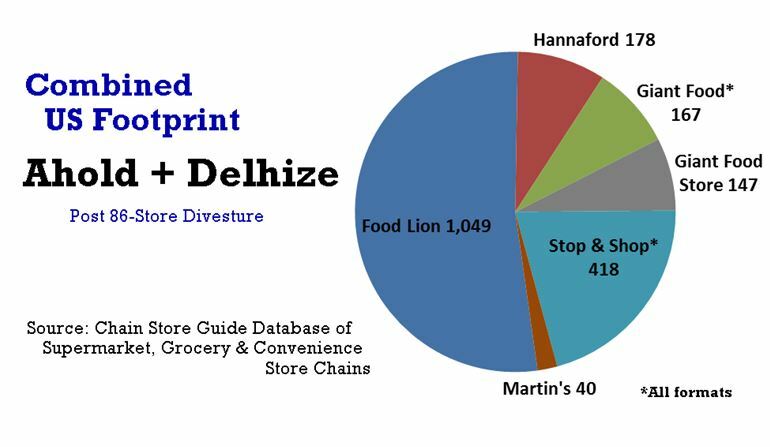 On a global scale, the deal affects more than 6,500 stores, approximately 2,000 of which are located in the eastern United States under the six different banners – Delhaize Group’s Food Lion and Hannaford and Ahold’s Giant Food, Giant Food Store, Stop & Shop and Martin’s (plus a single bfresh location). The individual brands and stores should realize some of the standard benefits conferred by economies of scale, but comments made by both Ahold and Delhaize over the course of the last year lead observers to believe that large-scale standardization of formats and store brands is not in the picture, at least for the near term. ✔ Publix: Publix purchased the 10 Martin’s locations in Richmond, VA as its initial entry into Virginia. Publix will close and reopen the locations under the Publix banner, a move that precedes greater expansion activity. Interestingly, Wegmans will be waiting for Publix in Virginia. The New York –based chain is also new to the state and looking to grow its presence, setting up a bit of competition from which shoppers should benefit. ✔ Weis Markets: Weis was the biggest beneficiary of the sale, scooping up 38 Food Lion Stores in Delaware, Maryland and Virginia in a move that increases the Pennsylvania-based retailer’s 163-store fleet by 23% according to CSG’s Database of Supermarket, Grocery & Convenience Store Chains.